microwave. More recently, mattresses and flat screen tv. We added hardwood floor in the living room and kitchen. There is an oak dining room table. There are steps down to the lake with a canoe on the dock. 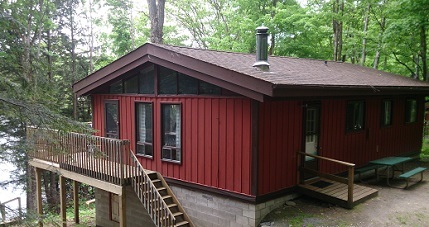 Screened in porch with gas bbq and deck on back of cottage. 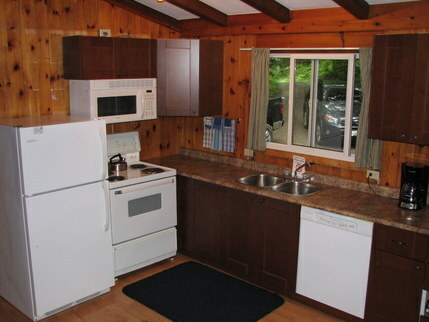 This cottage is well located between many amenities yet very private and only 1 step up to enter. Driveway is over 200 feet long. All of our deluxe models are fully equipped with satellite tv/dvd/vcr, pots and pans, all linens, towels, living room seating for 6 and a dining table for 6. Bathroom has full tub with shower, toilet, sink and 6 bath towels. There are 2 Queen bedrooms and a bedroom with 2 singles.